Common Name: Euphorbia root, Peking spurge root. Part Used & Method for Pharmaceutical Preparations: The roots are dug in autumn or spring. After the fibrous roots have been removed, the roots are cleaned and dried in the sun, and then they are soaked in vinegar. Properties & Taste: Bitter, pungent, cold and poisonous. Meridians: Lung, kidney and large intestine. Functions: 1. To transform water and reduce edema; 2. To disperse nodules and relieve swelling. 1. Boils, carbuncles, scrofula and subcutaneous nodules. 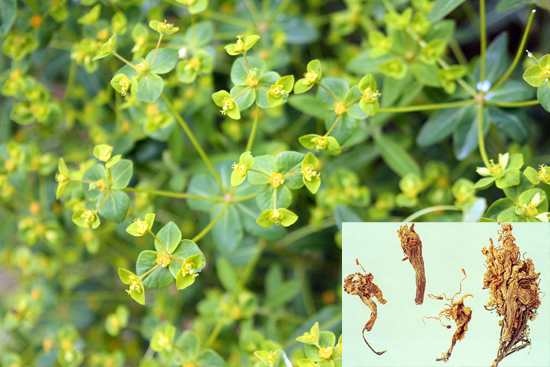 Peking spurge root (Daji) is used with Pleione rhizome (Shancigu) and Moleplant seed (Qianjinzi) for internal and external use in the formula Zijin Ding. 2. Edema of the face and the body, retention of fluid in the chest and ascites. Peking spurge root (Daji) is used with Jujube (Dazao), Kansui root (Gansui) and Genkwa flower (Yuanhua) in the formula Shizao Tang. Cautions & Contraindications: This herb should not be mixed with Licorice root (Gancao), and it is contraindicated during pregnancy.